This quote is from the song ‘Memorie di una Testa Tagliata’ (‘Memories of a Severed Mind’) by the Italian band Consorzio Suonatori Indipendenti. The lyrics remind us of last week’s article and link it in a metaphorical way to this week’s topic. Our next two articles explore the story of the Royal Palace of Madrid, one of Spain’s most important monuments. Night view of the ROYAL PALACE of MADRID (Spain) from Calle de Bailén (street). The Royal Palace is located on a hilltop between the slopes of San Vicente and San Francisco el Grande. According to tradition these lands were originally inhabited by witches, goblins and ghosts. Sightings had been reported since the reign of Alfonso VI in the eleventh century. However, it seems that during the construction of the Royal Palace in the sixteenth century their sleep was disturbed. It is said that many people died inexplicably around that time, but the most catastrophic event occurred on December 24, 1734. Whilst King Philip V was away at the palace of Buen Retiro, a fire mysteriously took hold, setting the whole of the palace alight. Such was the force of the blaze that it took four days to extinguish. 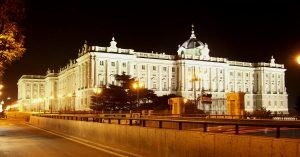 Could these strange facts be one of the reasons behind the current royal family’s decision to reside, not in the Royal Palace itself, but in the Palacio de la Zarzuela? Philip V was the first Bourbon king and it was rumoured that he disliked the old palace intensely. What a coincidence that it should catch fire during his reign… Be as it may, he took advantage of the opportunity to build a new palace in accordance with the fashion of the time. Philip ordered his advisors to summon the most famous architect of day. The project was originally undertaken by Juan Bautista Sacchetti, however it was finished by another architect, the Italian Francesco Sabatini. King Philip ordered the construction of the most luxurious palace in the world. No expense was to be spared. The architect gladly accepted the project and the magnificent palace was finished earlier than expected, to the King’s great satisfaction. King Philip was so pleased with the result that he invited the architect to lunch at the palace. Over the meal, the King asked the architect if he would be able to build another palace as magnificent as this one. Being an honest man the architect replied that he would have no problem in constructing another palace just as beautiful, if not more so. As you can imagine, this was not the reply the king had anticipated. He may have been the greatest architect in Europe, but he still had a lot to learn about politics… and he was going to find out the hard way. The king was concerned that other monarchs could soon commission a palace as beautiful as his palace and he wanted to prevent this from happening at all costs. He offered the architect a large sum of money for exclusivity, requesting that the man never construct another palace similar to the one in Madrid. However the architect refused. Again… he had a lot to learn. Blinded by greed, the King ordered the architect’s arrest, but didn’t stop there. He ordered that his arms be cut off so he could never again draw the blueprints for a palace as beautiful as this one. He ordered for his eyes to be gouged out so that he could never again behold a palace as beautiful as this one. And as a final offense, his tongue was cut off so that he could never tell anyone else the secrets to building a palace as beautiful as this one. The king kept the mute, blind and disabled architect living by his side for years. He had his own room in the palace, was waited on with exquisite care and surrounded by enormous wealth. It is even rumoured that he sat by the king’s side every morning, attended by dozens of servants. Perhaps after reading this story, you will see the palace in a different way next time you pass by. Of course, you can observe it’s beauty, unlike the poor architect. As you admire it’s classical features, take a moment to examine the detail of it’s facade. If you look closely you will notice that the pediments of the balconies are adorned with stone heads. One of these heads represents the architect whose story I have told. Perhaps the king realised the error of his ways and wanted to immortalise his image in stone as a token of recognition to a great master whose only fault was his honesty. (ESP) De raíces inglesas y australianas, residente en Madrid y ciudadana del mundo. Soy una viajera empedernida que cree en un mundo sin fronteras y en la libertad para viajar, tanto dentro como fuera de la imaginación. Elijo siempre el camino menos transitado y cuento las vivencias de manera bella y personal. - (ENG) From an English and Australian background, resident in Madrid and a die-hard globetrotter, I believe in a world without borders and in the liberty to travel both within and beyond one’s imagination, always choosing the path less travelled and telling my own story in my own way.